The Indonesians and the North Koreans were in Tokyo. They were only one day away from setting foot in the National Stadium and parading before 70,000 cheering spectators at the opening ceremonies of the 1964 Tokyo Olympics on Saturday, October 10, 1964. But on Friday, October 9, the national teams of those countries, hundreds of athletes, coaches and administrators, abruptly turned around and went home. Many cried as they waited to board the trains away from Tokyo, and their chance at competing at the highest level. Virachai Tanasugarn was on the Thai national Olympic team, a guard on his country’s basketball team. He was in Tokyo to play in a qualifying tournament with nine other national teams, with the chance to play in the beautiful Kenzo Tange Gymnasium Annex, and the hope of competing in the Olympics. And like the Indonesians and the North Koreans, he did not stay in Tokyo long enough to participate in the Games. But unlike the Indonesians and the North Koreans, he left with a sense of adventure and excitement. National Thai basketball team in Yokohama; Tanasugarn is #13. From September 25 to October 4, ten teams vied in the qualifying round for four spots, in order to be a part of the 18 national teams to play in the Tokyo Olympics. Tanasugarn was on the Thai team, a spot player on the bench, who was simply excited to be in Japan. Despite starting off well, defeating Indonesia convincingly 85-50, the team proceeded to win only 3 of their 9 matches. Tanasugarn, like his teammates, did not expect to make the cut. They were there to get experience, like so many of the other athletes from Southeast Asia. This was actually Tanasugarn’s second Olympic qualifier as a basketball player. When he was in Rome with hopes of helping the Thai team make the Olympics, he remembered looking at the spaghetti, cheese and ketchup and having no idea what they were or how to eat them. But when they came to Japan, they were happy to see more familiar food. They walked around Yokohama, went to Kamakura to visit the Big Buddha, and played lots of basketball against much better teams. Tanasugarn was so confident that the Thai team would not qualify that he had already bought an airplane ticket for California to leave before opening ceremonies. After graduating from Thammasat University, he was encouraged to go to the United States by a cousin who graduated from the University of California Berkley, and was practicing as a medical doctor in California. So unlike the Indonesians and North Koreans, Tanasugarn was excited to be leaving Japan just prior to the start of the Games. At the age of 26, with essentially no English ability, he was embarking on a new life in a new world. He went to a high school in San Francisco that had an adult education program where he learned English, and met his wife to be. He got his JD at the University of West Los Angeles School of Law, but could not find work in the legal field. Eventually, with his wife and mother, he opened up a Thai restaurant in Hollywood named Thai House, which he ran for 8 years. Through a friend’s introduction, Tanasugarn was able to put his first daughter, Rose, in the Jack Kramer Club, where some of the best tennis talent was being groomed: Tracy Austin, Lindsey Davenport and Pete Sampras. Their coach was Robert Lansdorp, and Rose showed progress as a tennis player. However, after 6 years Rose decided she did not want tennis to be the primary focus in her life, and left competitive play. While in the United States, Tanasugarn had divorced and re-married, having a daughter with his second wife that they named Tamarine. In 1982, he returned to Bangkok with Tamarine, then just 5-years-old. Tamarine began to focus on her tennis with her father as coach until she was 20, and then proceeded with professional coaches and increasingly competitive tournaments. Tamarine would go on to become Thailand’s most successful female tennis player ever, reaching the quarter-finals in Wimbledon in 2008 and the Wimbledon doubles semifinals in 2011, climbing as high as #19 in the world, and competing in four Olympics, from 1996 to 2008. Her father, Virachai, utilizing all the wisdom and insight he learned from observing Lansdorp and some of the best up-and-coming talent in the world at the Jack Kramer School in the 1970s, and watching first hand his daughter Tamarine rise to world-class levels, embarked on a career of tennis coach. At the Rama Gardens Hotel in Bangkok, he continues to coach tennis at the age of 80. Little did he know in Tokyo what future lay before him as he embarked the Pan Am flight for America in October, 1964. He looks at the tennis courts with pride, knowing that his daughter Tamarine, and the success she had, helped build the foundation for tennis in Thailand today. It’s only 80 kilometers away. The Demilitarized Zone (DMZ) is as far away as many of your car commutes, and yet in the gaiety of the Olympic Games, you forget that military on both sides of the DMZ are at the ready just in case. And like the DMZ that separates North and South Korea, there is a social DMZ that separates those in Korea who seek reunification, and those who seek to destroy North Korea. That drama played out on Friday, February 9, 2018, hours before the commencement of the 2018 PyeongChang Olympics. These anti-North Korean demonstrators were dressed in heavy down jackets, and the average age was easily over fifty. White poster: We support peace (between N and S Korea), and joining under one-Korean flag. Welcome North Korean team! Congratulations on the Joint North-South entrance in opening ceremony! This is the Realization of the Peace Olympics. Blue poster: “We enthusiastically welcome our North Korea family. And so, a little over three hours before the 8 pm start of the opening ceremonies, the two sides were drawn irresistibly together. As I turned to leave the anti-North Korean protests, which featured impassioned ripping apart of images of Kim Jong-un, I noticed up the path I was walking the blue hats of the pro-unification supporters. I did a 180, wondering what would happen….the scene from West Side Story as the Jets and the Sharks approach each other for their rumble, coming to mind. When the blue hats reached the rotary, the younger members in their white coats gathered in the middle rotary….and did what they do best. Sing and dance. The rumble was on. Thankfully, this was a peaceful rumble. People on both sides stayed on their own side. The Opening Ceremony started on time without controversy, and athletes from both South and North Korea entered into a raucous stadium together, waving the blue-on-white. On the whole, surveys indicate that slightly more South Koreans are against the unified team, than for it. The emotions run deep. But for one night, there was unity. It seems hard to believe that a nation would willingly drop usage of their flag to appease another nation, but that is what both North and South Korea are doing at the 2018 PyeongChang Olympics. The North Korean rocket tests in 2017 were raising tensions around the world, particularly in Asia, but South and North Korean leaders came to an agreement in January to unite the teams of the two border nations, so that they march together on opening day under the same flag. The flag is starkly simple, a blue silhouette of the Korean peninsula on white. There are variations that include various islands, but the one that will be seen at the Winter Games will be one that includes the oval of Jeju Island near the southern tip of the peninsula. 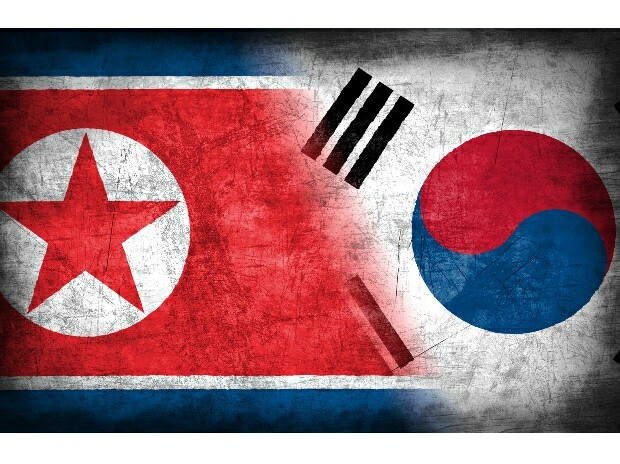 North and South Korea have united under one flag at three previous Olympics: at the 2000 Sydney Summer Games, the 2004 Athens Summer Games, and the 2006 Torino Winter Olympics. But since then, they have marched under their own flags, most recently at the 2016 Rio Summer Olympics. There is precedent for this symbolic unity. East and West Germany were put together under a single team at the 1956, 1960 and 1964 Winter and Summer Olympiads. Their flag was made up of the tri-colors black, red and yellow with the Olympic rings in white centering the flag. The national anthem was Beethoven’s Ninth – Ode to Joy. After the fall of the Soviet Union in December, 1991, twelve nations that were formerly part of the Soviet Union were banded together under the name “The Unified Team,” also known as the Commonwealth of Independent States (CIS). These countries were banded together in this manner because the now independent nations did not have enough time to establish National Olympic Committees with the International Olympic Committee in time. At both the 1992 Albertville Winter Olympics and the 1992 Barcelona Summer Olympics, members of the Unified Team marched under the Olympic Flag, which was composed of the Olympic Rings on white background. Their national anthem was the Olympic theme. It’s been eleven years, but North and South Korea will again march under the same flag. The Olympics of Ancient Greece were said to be about taking a pause in the political belligerence of mankind. Discontent has grown in South Korea in recent days over plans to include North Korea in high-profile roles during next month’s Games — complaints that prompted protesters on Monday to burn a North Korean flag and an image of the country’s leader, Kim Jong Un, in public. May the PyeongChang Winter Olympics, which will bring enemy brothers together, show us a better vision of ourselves. It was 1986. Preparations were under way for South Korea’s coming-out party – The 1988 Seoul Olympics. And on the other side of the demilitarized zone (DMZ), North Korean began preparations of their own, breaking ground for a dam to be built on the Bukhan River, a short 19 kilometers from the border. Completed in 2003, it is called the Imnam Dam. Perhaps fears of North Korean terrorism during the South Korean Olympics were top of mind for South Koreans, so they began to imagine the worst. As the New York Times explained in an article in 2007, then President Chun Do-hwan did imagine a scary scenario – the new dam in the North producing a monstrous flood, pounding waters headed straight for the South. In response to the so-called water-bomb scare, South Korean television networks broadcast artists’ conceptions of monstrous walls of water unleashed from the North Korean dam, wiping out most of Seoul, 120 miles downstream, with the impact of a nuclear explosion during the Olympics. A year later, in 1987, the fears were too hard to resist, and the South Korean government gave the green light to their own dam project, today called the Peace Dam. Located about 16 kilometers from the border to the north, the Peace Dam took a while to build, and in fact was finally completed in 2005, seven years after the Seoul Olympics. But it stands today, 125 meters high and 600 meters wide. There is actually no reservoir at the Peace Dam. Its sole purpose is to be peace of mind – a wall just in case the feared flood from the North ever comes racing down the Bukhan River – peace of mind in this case that cost USD429 million. It actually seems like a bit of expensive folly, and to be fair, the South Korean government suspended construction work on the dam after a few years. But when satellite photos apparently showed signs of cracks in the Imnam Dam in the North, fears of the deluge arose anew in the imaginations of the leaders. Work resumed, and the Peace Dam was finished. Actually, it is another dam in North Korea that is causing grief – The Hwanggang Dam on the Imjin River, which is 42 kilometers from the DMZ. Over the past several years, there have been 8 cases where North Korean officials released massive amounts of water, causing significant flooding in South Korea. It’s not the “nuclear explosion” impact that was feared in the 1980s, and yet 6 South Koreans were killed when water was released from the Hwanggang Dam in September 2009. The South and the North have an agreement that the North would provide notice to the South when they intend to release dam waters, commonly after significant rainfall, but in practice, the North Koreans rarely do. In the end, should they have bothered building the Peace Dam? I guess one could say that they were dam-ed if they did, and dam-end if they didn’t. 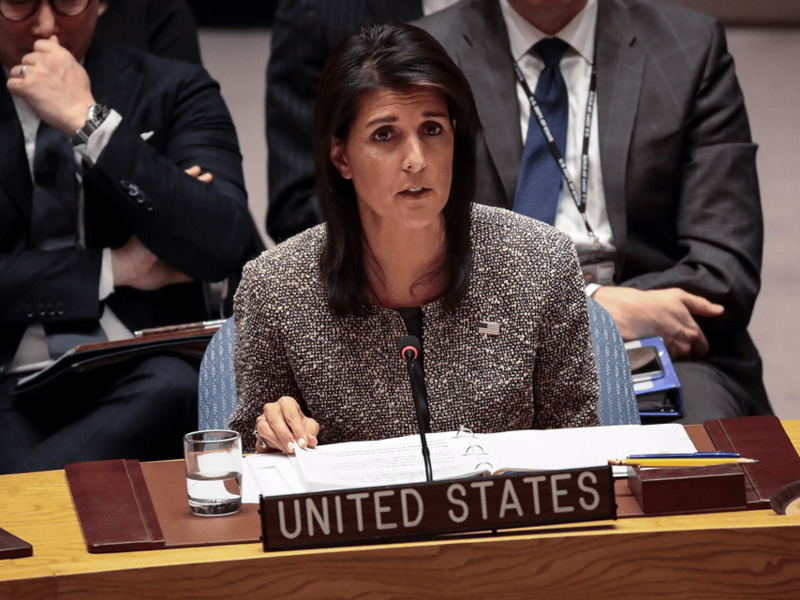 Nikki Haley Opens the Door to Closing the Door: Will the US Participate in the PyeongChang Olympics? Members of the PyeongChang Winter Olympics Organizing Committee must be pulling their hair out. Then on December 8, U. N. Ambassador from the United States, Nikki Haley, apparently raised the possibility of Team USA declining their invitation to the PyeongChang Winter Olympics due to fears that North Korea will create such an environment of uncertainty about safety that Americans would not be safe in South Korea. Haley’s comments prompted perceived backtracking by officials as White House press secretary, Sarah Huckabee Sanders was quoted as saying that “no official decision has been made” about America not going to PyeongChang. What’s interesting is how the press kind of over-reacted to Haley’s comments, in my view, reading a bit too much into the tea leaves. According to SB Nation, Haley’s quote was actually a very indirect reference to the Olympics. Haley saying that U.S. involvement is an “open question” was part of a larger quote — one that could hint at the topic never being raised in the first place. By saying “I have not heard anything about that” Haley’s answer seems to imply that no discussion is taking place on whether the U.S. will skip the games. Her saying it’s an “open question” is making the rounds, however, and that’s what people are picking up on. Earlier in the month, National Security Advisor to the US government, H. R. McMaster said, “Yes” to the question if Americans should feel safe about going to the Winter Olympics in Korea next year. But one word alone from McMaster will not diminish the fear. In recent months, France, Austria and Germany have also expressed concerns about safety in Korea, and raised the possibility of not going to the Winter Games in February. And with Russia out and America hinting at an exit as well, the PyeongChang is looking, quite possibly, at winter of discontent. On September 25, police ran a simulation based on a scenario – what if terrorists planted a sarin gas bomb in an office building during the 2020 Tokyo Olympics? About a thousand people were involved in this massive drill to see whether anti-terrorist plans on paper have any founding in reality. The drill was held not far from where the new national Olympic stadium is being built in Tokyo. Some 800 people were evacuated from the area and a bomb disposal team, using a robotic arm, successfully removed a bag that was said to hold a bomb. These kinds of drills are important to gauging feasibility of anti-terrorist plans and readiness of relevant security and safety groups. But when it comes to the 2018 PyeongChang Winter Games, which is to commence on February 9, there are nations that are beginning to think no anti-terrorist plans or level of readiness of security personnel that will comfort them. Thanks to the belligerent talk and the test launches of ballistic missiles by the North Korean government in recent months, France and Austria are saying they may turn down their invitation to the upcoming Winter Games, as quoted here. We will never put our team in danger. If it gets worse and we do not have their security confirmed, our French team will stay here. – Laura Flessel, Sports Minister of France. If the situation gets worse and the security of the athletes is no longer guaranteed, we will not go to South Korea. – Karl Stoss, the head of Austrian Olympic Committee. Germany is also reportedly mulling a decision to not send their athletes to South Korea. 22-year-old American, Otto Warmbier, was released in mid-June, 2017 from a North Korean prison in a coma, only to die a few days later after returning home. Test missiles routinely take off from North Korea, much to the alarm of Japan, China and the rest of the world. It appears no one really knows how to deal effectively with the North Korean government, and so the world is in a sudden state of panic every time North Korea makes noise. And yet, South Korean president, Moon Jae-in, is thinking out loud, wondering why we can’t just all get along. As South Korea will be hosting the Winter Olympics in PyeongChang in early 2018, President Moon is looking for opportunities to bring North and South Korea together. One idea is to have North Korea host an event, since there are skiing and skating venues in the North. One of the places that could host skiing events is Masikryong Ski Resort. About a 3-hour drive East of the North Korean capital, Pyongyang, Marikryong was established by the North Korean Supreme Leader Kim Jong-Un. According to the Telegraph, the Masikryong Ski Resort was criticized internationally for employing child labour to keep this largely underused resort available to service the elite of North Korean society. Click on the image below to see a video created by the North Korean government promoting the site. Currently, no one in North Korea is eligible for the upcoming Winter Games. There is hope that the two Koreas could field a women’s ice hockey team for the PyeongChang Games.